Ryukyu Shimpo – Okinawa, Japanese newspaper, local news » Inaugural A-lunch Championship held in Okinawa City. 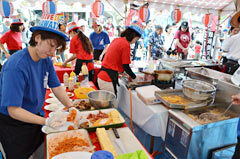 On October 23 at the Koza Sports Park in Okinawa City, long queues formed at the inaugural A-lunch Championship. Staff from the Drive-in Restaurant Hawaii, the winner of the A-Grand Prix, prepare meals in a booth. On October 23, at the Koza Sports Park in Okinawa City, “The First Koza A-lunch Competition” (hosted by Okinawa City Restaurant Business Association) was held to select the most popular “A-lunch,” a typical lunch menu in Okinawan restaurants. Eight restaurants located in and around Okinawa City put their best meal forward at a price of 500 yen, and a total of approximately 2,500 meals were served with many people lining up to try the meals. This competition was held with the aim of revitalizing the city through “A-lunches,” a concept thought up by a chef at the New York Restaurant in Moromizato, Okinawa City after the Battle of Okinawa, and from there it spread throughout Okinawa. The association has actively promoted the A-lunch, creating an “A-lunch song” and selling special A-lunches at a Ryukyu FC soccer match held at the City’s Athletic Stadium. At the Competition, people could vote once per meal ticket purchased. Families and friends of competitors enjoyed the A-lunches from each restaurant. At noon, long lines of hungry customers formed in front of each restaurant and competitors worked hard cooking and arranging foods inside the cooking booths. Tacos, deep-fried shrimps, hamburger steak, fried eggs, potatoes, sausages, spaghetti, salad, and many other items were available on the menu. Customers happily waited in a line to buy meals for the discounted prices.